Guest Contribution: Is the US Current Account Deficit Problem Over? Today we are fortunate to have a guest contribution written by Jeffrey Frankel, Harpel Professor of Capital Formation and Growth at Harvard University, and former Member of the Council of Economic Advisers, 1997-99. The latest World Economic Outlook, released this month by the International Monetary Fund, warns that even though global “flow imbalances” are lower than a few years ago, they are still substantial and so US liabilities to foreigners continue to rise each year. “Stock imbalances” remain a problem. Figure 4.1 from Chapter 4, World Economic Outlook, October 2014. The US current account went into deficit in 1982. Thirty years ago, the US Council of Economic Advisers accurately predicted record current account deficits to come and attributed the problem to budget deficits, a low national saving rate, and an overvalued dollar. Indeed, every year subsequently the Bureau of Economic Analysis reported another current account deficit. The necessary implication is that the US has been running down its net investments overseas and borrowing from the rest of the world. Knowledgeable forecasts said that if the US did not adjust, it would go from world’s largest creditor to world’s largest debtor. Many of us worried that the imbalances were unsustainable and might end in a “hard landing” for the dollar when global investors got tired of absorbing ever-greater quantities of dollars into their portfolios. The indebtedness predictions were correct. 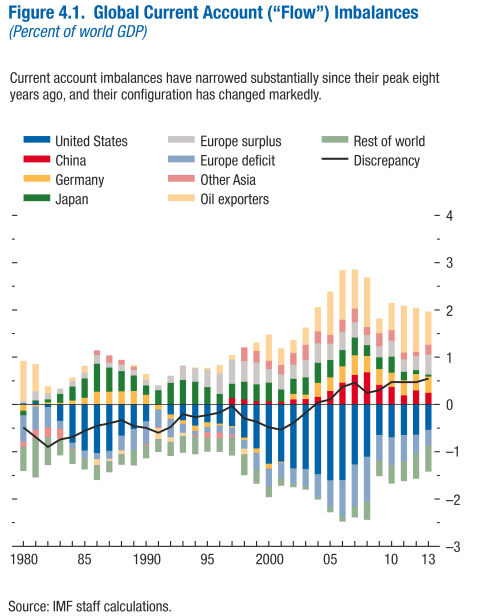 As recently as eight years ago, the current account imbalances were toward the top of topics worrying international macroeconomists. And yet, it is time to ask if the US current account deficit is no longer a problem. For one thing, a substantial amount of US adjustment did take place. I am thinking, for example, of the dollar depreciations of 1985-87 and 2002-07 and the fiscal deficit reductions of 1992-2000 and 2009-2014. The big increase in domestic output of oil and gas associated with “fracking” has also helped improve the trade balance. The recorded current account deficit is now substantially down from its 2006 peak levels. It has fallen by half in dollar terms, or from 5.8% of US GDP to 2.4%. This is a decline of 2/3 when expressed as a percent of world GDP. A symmetric adjustment has also occurred in China, via real appreciation of the currency and higher prices for labor and land. China’s trade adjustment in some respects followed in the footsteps of Japan, which had been the original focus of American trade anxieties in the 1980s. For another thing, the world’s investors in 2008 declared loud and clear that they were not concerned about the sustainability of the US deficits, when they reacted to global financial crisis by flooding into dollar assets rather than out, notwithstanding that the crisis had originated in the United States. I would like to offer a third notion why perhaps it is time to stop worrying about the US current account deficit, an idea that is more speculative. It is possible that, properly measured, the true deficits are smaller than has been reported, and even that in some years they are not there at all. Every year, US residents earn investment income overseas — interest on bonds, dividends on equities, and repatriated profits on direct investment — which they invest where it came from. For example, corporations earn profits overseas which they plow back into their operations, often to avoid the high US corporate income tax that they would have to pay if they brought the profits back. (Another form of arbitrage of the international difference in corporate tax rates has received a lot of attention recently under the topic of controversial “tax inversions” by the likes of Burger King and Pfizer.) Technically, this should be recorded as a bigger surplus on the investment income account, matched by greater acquisition of assets overseas. Often it is counted right. But there is some reason to think that investment income is under-counted. The world has long run a substantial deficit in investment income, even though the correct numbers should sum to zero. The missing income must be going somewhere. Even for officials as highly competent as those in the US Bureau of Economic Analysis, it is impossible to keep track of all the stocks and flows in the international economy. Everyone knows that errors and omissions are large, especially when it comes to financial transactions. Problems of mismeasurement are exacerbated by under-funding of statistical agencies in the federal budget, but would exist regardless. Less well-known is a particular pattern to the revisions in the US international investment position. Going by the currently available historical statistics, in every year from 1982 to 2000 the numbers for the net international investment position that were reported at the time were substantial under-estimates. The major reason for the subsequent upward revisions is that the statisticians found overseas assets that they previously had no way of knowing about (in periodic BEA surveys of direct investment and Treasury surveys of portfolio investment). In the post-2000 years, some subsequent revisions have been positive and some negative. Despite more frequent surveys of portfolio holdings in recent years, some new asset acquisitions probably still go unreported, for example some held with foreign custodians. The numbers are potentially huge. The accumulation of the reported US current account deficits from 1982 to 2013 is almost $ 10 trillion $9.9 trillion if one goes by the current account numbers that were reported at the time, $9.5 if one goes by subsequent revisions. And yet the deterioration in the US international investment position over this period was not much more than half that amount ($5.7 trillion if measured relative to the revised estimate for 1981; $5.6 trillion relative to the NIIP that was known at the time). Certainly a lot of the discrepancy is attributable to valuation effects: since 1982 the dollar value of overseas assets has increased repeatedly due both to increases in the dollar value of foreign currency and increases in the foreign-currency value of the overseas assets. But perhaps part of the discrepancy is also due to the discovery of missing assets, some of which may have originated in reinvestment of overseas income during the period. The missing credits could also have been earned in other ways. US multinational corporations may sometimes over-invoice import bills or under-voice export earnings, for example to reduce their tax obligations. Again, this would work to overstate the recorded current account deficit. Consider an illustrative calculation, admittedly extreme. If true investment income were double what is reported and the difference was reinvested abroad in the years 1982-2000, and those assets were discovered by 2014, that would explain about half of the upward revision in the US Net International Investment Position. Net investment income has remained surprisingly large despite the fact that the measured NIIP did eventually turn substantially negative. This is not really evidence however, as some have suggested, of uncounted foreign assets: most of the investment income is calculated from known assets. The apparent paradox is explained, rather, by the fact that Americans tend to earn a far higher rate of return on their overseas investments (think, especially, direct investment) than they pay on their overseas liabilities (think, especially, US Treasury bills). To investigate the numbers on investment income, one must be aware that the US BEA has started folding investment income into a category that is unhelpfully called “primary income,” in a comprehensive restructuring of the accounts that took effect in July of this year as part of an international effort to harmonize balance of payments accounting conventions. If something like that under-reporting of reinvested earnings or other balance of payments credits has gone on in the past, then the process may still going on especially with US firms becoming aggressive about arbitrage of the corporate income tax. If true investment income were indeed as large as double what is reported, then the implication would be that the true current account went back into the black in 2009 and has been in surplus since then! A shorter version of this column appeared at Project Syndicate. This entry was posted on October 24, 2014 by Menzie Chinn. Interesting. I’m sure there’s some of this, though probably also by foreign investors in the US, and who knows which side does more. It wouldn’t surprise me also if statisticians are already including some estimate of under-reported foreign-earned income. The BEA isn’t as understaffed as the author seems to think. I think the more direct reason not to worry is that the investment income balance never went negative and has been on a generally upward trend since the late 90s, reaching $200bn+ a year since 2011. The US government can raise money cheaply thanks to its huge store of fiscal credibility, while US capital and corporates are relatively adept at finding high-yield investments abroad. That still leaves the theoretical threat of a sudden reversal of investment flows, but indeed there is a big cushion thanks to that credibility and the haven status it has given to dollars and Treasurys. I would say in 2008 foreign investors flooded out of most dollar-denominated assets and into dollars and Treasurys, but anyway the effect of a US-born crisis was to strengthen the dollar. Plunder: to rob of goods or valuables by open force, as in war; despoil, or fleece; to take wrongfully, as by pillage, robbery, or fraud; loot. BEIJING (Reuters) – The United States has plundered global wealth by exploiting the dollar’s dominance, and the world urgently needs other currencies to take its place, a leading Chinese state newspaper said. My comment: The U.S. has benefited enormously from globalization, i.e. open markets, free trade, and unrestricted capital flows, along with the dollar being the predominant world’s currency, while our trading partner’s benefited much less from their anti-globalization policies. As the author points out this is a highly speculative exercise. The difference between cumulative current-account deficits and the net IIP is in fact largely explained by valuation changes, especially now that direct investment positions are measured on a market value basis. I’m fairly sure that missing assets and liabilities uncovered in later surveys would be at least partly allocated to prior period financial transactions during the subsequent revisions. Also, errors and omissions (statistical discrepancy) have been largely positive in recent years, indicating a cumulative shortfall of financial inflows to the U.S. relative to financial outflows from the U.S. This suggests that U.S. financial assets abroad are overstated relative to foreign financial assets in the U.S. Other things equal, this would tend to overstate the U.S. investment income surplus, primarily by understating the deficit on portfolio investment income. BenAround, if U.S. financial assets abroad are overstated, and foreign financial assets in the U.S. are understated, that means U.S. financial assets are actually earning even higher returns abroad. The income flows show U.S. investments abroad earn about twice the return than foreign investments in the U.S..
And, if foreigners are investing more in the U.S., and paying a higher price for U.S. assets, compared to the U.S., that would add to the U.S. investment surplus. Correct that the U.S rate of return on assets held abroad is much higher than the foreign rate of return on U.S. assets. However, that is entirely due to direct investment rather than portfolio or other investment, which combined are much larger than direct investment. An overstatement of U.S. portfolio assets abroad relative to foreign portfolio assets in the U.S. will lead to an understatement of the U.S. portfolio investment income deficit, which is already quite large. This would be an offset to other factors that might tend to reduce the current account deficit.